When I came in I didn't "fix" anything, I reinterpreted Reed's actions to be consistent with my take on his character. In December 2008 Dwayne McDuffie kindly gave an interview with Fantastic Four Headquarters after his recent run on the title. The writer behind issues #542-553, he gave an intriguing insight into the behind-the-scenes involvement of his run. Sadly, McDuffie died in February 2011, aged just 49. ‍It seemed that a lot of your run was involved with having to tie up loose ends, with the Civil War subplots still hanging over from Joe Straczynski’s run and then The Initiative. How much editorial influence was there in what you were allowed to write, and did you wish that you could have written more stand alone stories? Actually, I was asked to finish up Joe Straczynski’s run when his plate got a little full. With all of his comic book, TV and movie projects, something had to give, luckily for me, it was my all-time favorite comic book. Marvel was great, they told me what I had to do (bring in Black Panther and Storm, remove Reed and Sue), but they let me figure out how. And then I got lucky again, a planned Reed and Sue mini-series was cancelled, and Marvel let me bring them back into the book. I don't know if anyone noticed, but Reed and Sue appeared in every issue of the FF that I wrote, even during the period that they were "off the team." I think the way the Marvel Universe works now, it's hard for a title to get traction unless it's tied into the larger universe's major storylines. We found a nice balance, dealing with Fantastic Four business, while still doing stories that counted in the context of Civil War and The Initiative. In the run immediately before you joined, Reed had been acting out of character with the Civil War. Yet in your first issue you fixed this, explaining his secret motivations. How much of that was your idea, and how much of that was pre-planned before you joined the book? I don't think Reed was out of character, I just think it was a different interpretation, necessary to tell the story they were telling. When I came in I didn't "fix" anything, I reinterpreted Reed's actions to be consistent with my take on his character. 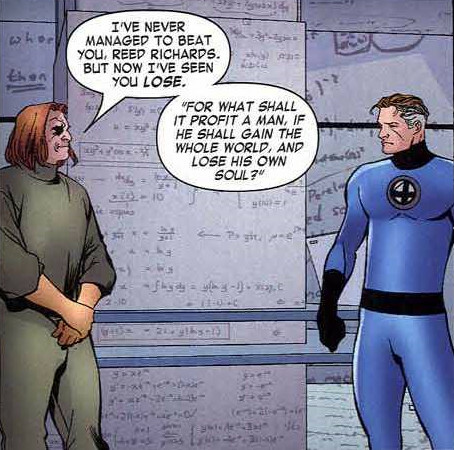 Not surprising really, as my friends point out Reed Richards is my "Mary Sue," so he had to be a hero again, even if a tragic one. I don't know what Marvel's original plans were, we never discussed them. I just read the scripts that came before and worked up something that would allow me to get where I wanted to go. You were on record from at least as far back as 1988 as saying you wanted to write for the title. Did you get everything out of it you wanted, or would you have liked to have done more? I'd have loved to do it as a full-time ongoing gig, but that was never the plan. Tom brought me in to do just four issues, then he asked me to come in a couple of issues early, and then I was asked to stay on for three or four extra, so I got to write 10 or 11 issues, I think. Way more than I was promised. I would have paced things differently if I had known it was going to be that long from the start, but on the whole, I'm happy with my run. The first artist you worked with on the book was Mike McKone, a Scottish illustrator. Were you still working on “Marvel Plot”, and was it strange working with someone who (presumably) had never seen the cities he was illustrating in real life? The remainder of your issues were done with Paul Pelletier, a penciller with a very distinctive style. How was it working with Paul, and was this also on “Marvel Plot”? Paul is an outstanding talent, combining Marvel style dynamics with excellent story telling, acting and design. It was always a pleasure getting new pages from him. Again, though, this was full-script. 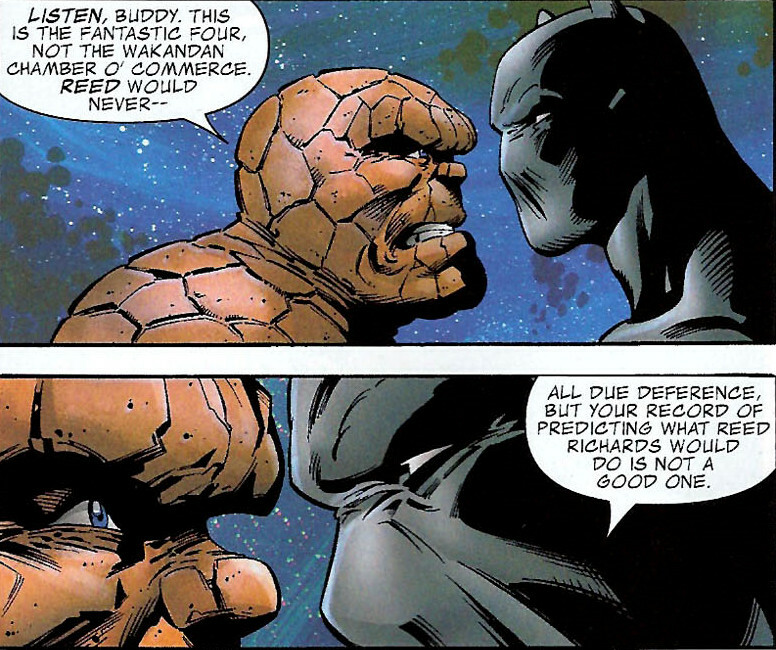 ‍It perhaps should be noted that you were the first black author to write The Fantastic Four. This wouldn’t seem a major event if it wasn’t for the fact that it took forty-five years for this to happen. How did you feel upon getting the commission? Actually, I'd assumed that Jim Owsley must have done it before me (and likely someone else in the nineties, no?). In any case, I wrote a Fantastic Four What If back in the late Eighties and an FF Special one-shot a couple of years ago, so it wasn't my first time. It was good to see the Black Panther back in the title for a time. During his brief stay there seemed to be more tension between himself and the other FF members than we’d previously seen… is this the way you’d envisioned the character, or just an evolution of his previous traits? There was absolutely no tension between him and the team intended, he played around with Ben, joked with Johnny and uncharacteristically deferred to both of them in their areas of expertise. I think you may be reading in a bit. One notable element of your take on the series is that it was quite adult in tone. In particular there was the Wizard smacking blood out of Sue’s mouth and some bad language, including Hydro-Man interrupted in the middle of saying MF. Do you regard comics today as being there for the older generation who never grew out of them, rather than the child audience that they used to have? 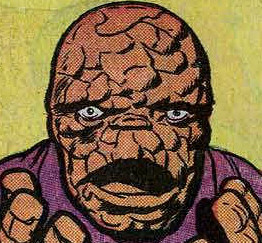 I wish there were still lots of kids reading Fantastic Four, but there aren't. Coming out of Civil War, it would be disingenuous to claim the title was intended mostly for children, so I wrote it for the audience that was there. Finally, it’d be nice to see you get a longer stay on the title. If you had the chance to return to The Fantastic Four, would you take it? If my schedule allowed it, instantly.